We may love cooking in the kitchen, but do you ever have those days where you are running low on time but still want a high-quality meal? I have those days. I may not have the time for a long drawn out dinner, but I still want good food! 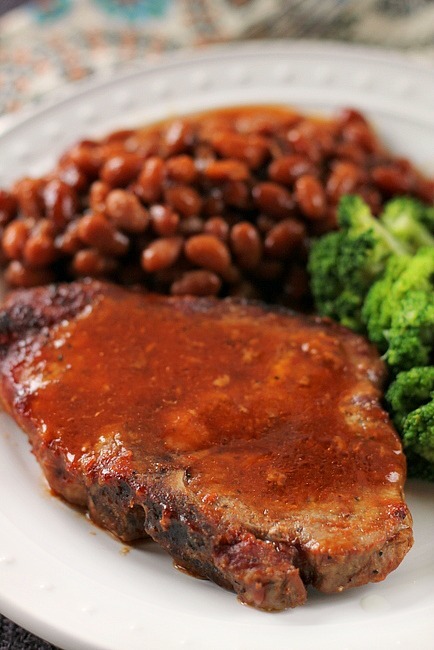 Baked Pork Chops with Beans is so easy to make you can make it on your busiest day. You come home from work and within 15 minutes have dinner in the oven. I like dinners like that. Make the baked pork chops and then forget about it for an hour. Instead of spending hours in the kitchen, you can put your aching feet up and relax. Who doesn’t love a meal like that now and then? It doesn’t get better than that, kids. These easy baked pork chops come out nice and tender. They are the perfect comfort meal after a tough day. Want to know the best part? The baked beans bake with the baked pork chops. Nice, huh? It doesn’t get easier than these easy baked pork chops. You are way ahead of the game with your entree and one side dish already made. Add a salad or corn on the cob and you’ve got dinner. 1. Salt and pepper the pork chops. Cook the pork chops in a frying pan until nice and brown on the outside. Remove from the pan to a plate. 2. 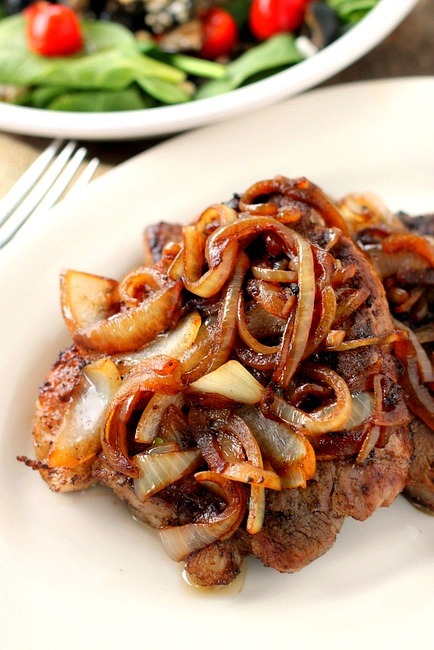 In a medium bowl combine the onion,1 Tablespoon Worcestershire sauce, baked beans and brown sugar if using. Place the pork chops in a 13x9 inch baking pan. Pour the baked beans over the chops, dot with butter. Cover the pan with foil, bake for one hour 350 degrees. My Dad is an authentic West Texas Cowboy and has instilled a love of beans with me. This looks wonderful! I’ll have to try it! I’ve got your meme schelduled for tommorow. Thanks for the sweet note about my stories! I’m so glad you like them! I’ll be in Alaska tommorow, but I’ve got blogs schelduled for Friday and Saturday so be sure to stop by! This looks easy — and filled with protein. A great concept to play around with… love those beans! Loved your tag below Bunny and I love this casserole dish you have posted. Two of my favourite things! Pork chops and beans! Yummy! Bunny, we’re having an unusually cool day in my neck of the woods, and your offering of Pork Chops and Beans is a very comforting sight. That looks really good! Easy dinner is always a plus, too. 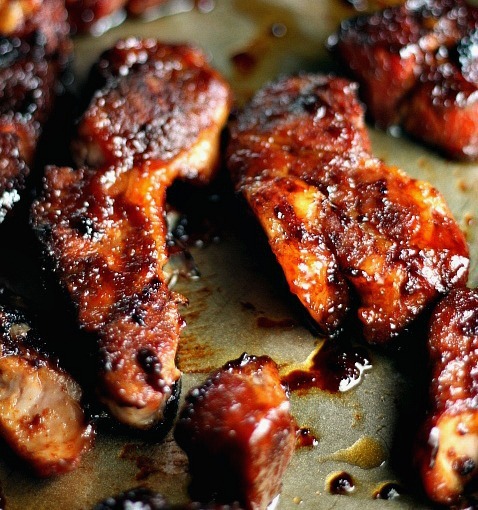 I’ve done that same thing with pork loin–it’s such a money saver! Cindy I don’t see why not, I haven’t done it but it would work! I don’t even pan fry the chops….. Preheat oven to 350 degrees, in the meantime, dump your canned beans into your baking dish, place pork chops (bone in or out) on top of beans (seasoning as desired) and place in oven on middle rack. If you enjoy baked potatoes, simply foil wrap 2 to 4 and place directly on rack in oven along side dish, bake for one hour. There you have a complete meal, baked chops, beans and potato …..delicious !!!! !